Were you there when the whales came ashore? It’s amazing how many people remember witnessing this catastrophic event on a stormy autumn day in 1970. 59 sperm whales swam into the shallows at the northern end of Wainui Beach and died in a seething, bleeding mass. It was a tragic event that has become part of the history of Wainui Beach. It was indeed one of those defining moments, at least in local history. It was a cold, overcast Wednesday morning, March 18, 1970. The whales had started coming ashore in the night. At first light they had been spotted by a beach resident who called the local radio station, 2XG. Reporters Derek Fox and Tony Cyprian drove to the beach and filed reports over the radio. The people of Gisborne flocked to the beach to view the spectacle. I was amongst them, a 16 year old sixth former. We heard it on the radio and my dad drove me out before school. It was a fascinating, ghastly spectacle. This was in an era before people were super-sensitive about whales and their survival, but it was still a heart-breaking thing to witness. There were mothers, babies and full grown males. The sea was running high. A slow moving depression over Northland had Gisborne in the grip of one of those lingering easterlies. There was a hazy sea mist. It was cold for March. The waves were washing high up the beach. The sorry sight in the sandy shallows was only half the story. Here we observed scores of the floundering, hulking, black mammals rolling in the breakers, blowholes expelling stale air, flukes flapping, tales slapping the sandy shallows. There was nothing anyone could do turn to them back. At 8am others were still coming in. The worst half of the story was the plight of many of the pod who had hit the shore further north beyond the sandy beach and were flailing themselves on the jagged rocks of the Wainui-Makorori headland. Here the sea was red. Blowholes ejected crimson plumes. A scene from Dante’s Inferno. Traffic jammed State Highway 35 for a mile. Bob Hannah, a well known local traffic cop, was in a lather trying to sort out the double parking and the snarled traffic all the way back to town. Later that day the Gisborne Herald front paged the event with the headline: “Whales come ashore to die on Wainui Beach”. The stranding, and the burial of the whales, made the front page until Friday when the story was upstaged by the arrival in Gisborne that weekend of the Queen, the Duke of Edinburgh, Princess Anne and Prince Charles who were at the time making a Royal Tour of New Zealand. The royal welcome was held at Rugby Park. The GDC’s Lysnar Reserve Management Plan report quotes a local Maori belief from the time of the stranding that the Royal Tour may have been the cause of it. It says: “A local Maori theory of why the event had occurred was because at the time, two French war-ships were berthed in the harbour as a royal visit from the Queen was imminent. History had proven to local Maori that major human tragedies had coincided with previous royal visits. Maori leaders agreed that the whale stranding was a major tragedy and the whales had taken the consequences for the people. Therefore, the people were protected for this royal visit. No reason, outside of the spiritual, has ever been agreed upon as a conclusive reason why such a large number of whales came ashore at Wainui that day. However recent research into whale strandings in the North Sea suggest increased solar activity, causing disturbances in the Earth’s magnetic field, may cause whales to run aground. Analysis of documented whale strandings between 1712 and 2003 shows that more (up to 90%) occur when solar activity is high. Scientists propose that whales use the Earth’s magnetic field to assist navigation like homing pigeons do. As the Sun disrupts the magnetic field whales can become confused, they say. It is interesting to note that there was much publicised total eclipse of the sun on March 7th, 1970 – 11 days before the strandings. The SPCA had received numerous calls from outraged Wainui locals who had observed people hacking at the whale carcasses. Men were seen knocking out whale teeth and others cutting chunks of flesh from them while they were still alive. This reporter remembers witnessing such an occurrence where a couple of men hacked at a whale with an axe to the horror of more sensitive people who were calling on them to stop. Local schoolgirl Leigh Schroeder (now Dawson) was 10 years old at the time and remembers Wainui School children being taken to see the whales. The sight of the whales being chopped up by men with axes and chainsaws was a nightmare she would never forget. Leigh remembers later being chosen from classmates to write to the Council on behalf of the school suggesting that a plaque be erected at the site to commemorate the stranding event. By the start of the third day it was obvious that most of the whales had died and concern shifted to the problem of disposing of the bodies before they started rotting. It became the Ministry of Works’ challenge and a plan was hatched to bury the whales in a mass grave to be bulldozed in the adjacent sand dunes. An estimate of between $5000 to $10,000 was provided to dig a hole 500 feet long, 30 feet wide and 15 feet deep. A channel was dug through the sand to the beach through which the bodies were pushed and towed by two bulldozers into the grave. Once in the grave the carcasses, totalling some 1800 tonnes, were cut open to speed up decomposition. Workmen had to spray a deodorant on the carcasses and gas masks were brought into town from Waiouru military camp. The recent GDC report is concerned at a lack of significance given to the site of the Whales Grave over the years. As well as upgrading signage, fencing and car parking the report wants to “turn what is currently a rather disappointing and dangerous road-side stop into a historical feature of the Lysnar Reserve”. 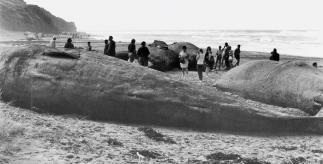 FOOTNOTE: On October 29th, 1994, another mass stranding saw 72 sperm whales die on Muriwai Beach, near Auckland.